First, I want to plug the home.health.love Facebook page. If you find this blog useful, then others you know may enjoy it, too. Please help spread the word by clicking on the Facebook “Like” button on the right-hand side of this page. Thank you! People love to cook with coconut oil. Experts say it’s the healthiest of all oils: it’s good for your heart, thyroid, immune system, and can actually support weight loss. It’s also great for cooking and baking because it can withstand high heat and doesn’t break down into potentially toxic components when cooked. For a good discussion of all of these health benefits, check out Dr. Mercola’s article. Coconut oil is a great all-purpose skin AND hair moisturizer! It doesn’t clog your pores, or leave your skin feeling dry, as do some products containing water or alcohol. You can use it on your face, body, hands, and even instead of lip balm. You can also use it to deep condition your hair and tame frizz. And, it’s great for moisturizing soft baby skin! It comes highly recommended as an all-natural personal lubricant (though not for use with latex). It’s a great alternative to Vaseline for lubricating a thermometer when taking a baby’s rectal temperature. Vaseline is made from mineral oils, which are possibly carcinogenic. Finally, it’s also a great healer. When I have a rash, skin irritation, itchiness, or burn (from sun, or from a skin product that’s a bit too harsh for my skin) anywhere on my body, I use coconut oil. It cures my skin ailments, and does it quickly. Try it and see if it works for you. At the very least, it should provide soothing comfort. Only ONE ingredient: never worry about what artificial substances have been added. It’s like a breath of fresh air. I hate worrying about unknown substances in my skin-care and make-up regimen. Coconut oil is worry-free. Same product for the whole family: I keep a jar in my bathroom and by my daughter’s changing table. Sometimes I scoop out some of the coconut oil and put it in mini containers that I can keep in my bag, in my nightstand, or anywhere else I might use it. Has a barely-noticeable, but pleasant scent, which is good for those of us, like me, with sensitive noses. Easy to find: you can buy it at health food stores, online and supermarkets. Affordable: one jar goes a long way. You only need to use a little bit at a time. It lasts me months! I buy the extra virgin, unrefined, organic kind, so I know it’s not made with GMO and is in its purest form. I’ve used Barlean’s and Spectrum Organics. I don’t have a particular brand preference, but I do like the fact that Spectrum comes in a glass jar. I’m always skeptical of plastic containers, so if I can easily avoid them, I do. Please share your coconut success stories in the comments section! Categories: Did You Know, Natural Remedies | Permalink. In my home, viruses and bugs like to play musical chairs with our immune systems. First my daughter gets sick, then me, then my husband, and then the cycle starts all over again. A couple of months ago I was perpetually sick for more than 4 weeks. I finally had enough of it! I committed to being consistent about my cold-prevention regimen, and so far, so good. One of the amazing things about natural remedies, is that you can use them to both prevent AND treat. Often, you just need to increase the dose and frequency of the remedies when you are actually sick. Here is what I do, below. I offer DIY alternatives, when possible. You can do all of these together, or mix and match. 1. Daily multi-vitamin and C: When I’m feeling good, getting sleep, and people around me aren’t coughing and sneezing, I don’t take a multi-vitamin every day. I eat pretty well, and it’s best to get your nutrients from real food. But during flu season, I take my multi every day, just in case, and I add additional C. If someone in the house is sick, I’ll take a C vitamin several times during the day. Make sure to consult your health practitioner about the right C-vitamin dosage for you. 2.Eat lots of garlic and ginger: both are immune-boosting, anti-inflammatory agents. Use them as often as you can in your cooking. They are great in stir-fries, soups, and you can make great sauces and marinades with them. Try to under-cook them a little bit so they have maximum nutritional value, if you can handle the flavor. I enjoy making a ginger-teriyaki sauce for salmon and veggies: combine soy sauce, minced garlic and ginger, honey and orange juice (optional). People always ask me for the recipe. You can buy whole, peeled, organic garlic in health food stores. This way, it’s ready to go. GINGER DOES NOT NEED TO BE PEELED! Did you know that? Buy organic, wash it, and then mince it with the skin. I do this all the time, and nobody notices it wasn’t peeled. At the beginning of the week, mince garlic and ginger (separately) in a mini-food processor or blender, and then store them in separate containers in your fridge. This way, you can just grab a pinch (or a handful!) and throw it into whatever dish you are cooking! They will keep for about 3-7 days in the fridg. 3. Elderberry (Sambucus): relieves coughs and congestion, enhances immune function, lowers fever, soothes the respiratory tract and is effective against flu viruses. Awesome, right??? It’s typically found in syrup form in health food stores and online in a bunch of varieties for adults and children. It tastes good: like berry-flavored maple syrup. My favorite is Nature’s Way “Immune System Syrup,” which includes also includes echinacea, propolis, zinc, and vitamin C. The directions instruct you to take a certain amount for daily consumption to prevent illness, and an increased amount for when you are sick. Note: if you are pregnant, elderberry is not recommended, though it’s generally ok for nursing mothers and infants and toddlers (read more here). As always, consult your doctor. But, I promised you DIY, right? And the syrups can get a little pricey (about $10-$20 for 8 oz). So here’s how you can make it yourself: To start, buy organic, dried elderberries. For about $20 (or $14 for the non-organic version) you can make yourself a bunch of bottles of the syrup, probably enough to last you a few months or the whole season! I found and used a recipe from one of my favorite natural-living blogs: the Soft Landing. I omitted the clove powder from the recipe, otherwise all the other ingredients were already in my kitchen! The glass jar in the photo, above, contains my home-made version! 4. Oregano oil: Some people refer to oregano oil as “nature’s antibiotic.” It’s made from varieties of the plant found in the Mediterranean region, not the kind you find in stores. Numerous studies have been done illustrating its antiseptic and healing properties (see summaries here). It has a strong taste, but you only need a few drops at a time. And, it seems expensive, but it’ll take you many months to go through it, since it’s so potent. I usually buy the Oregonal brand–you’ll be convinced by the amazing reviews on Amazon! 5. Zinc: Another immune-system booster, in lozenge or supplement form. Follow directions on the label. Zinc supplements should only be taken when treating a cold. Do not exceed 100mg. Consult your doctor. Happy Preventing and Happy Treating! I’d love to hear about your favorite cold remedies in the comments section! 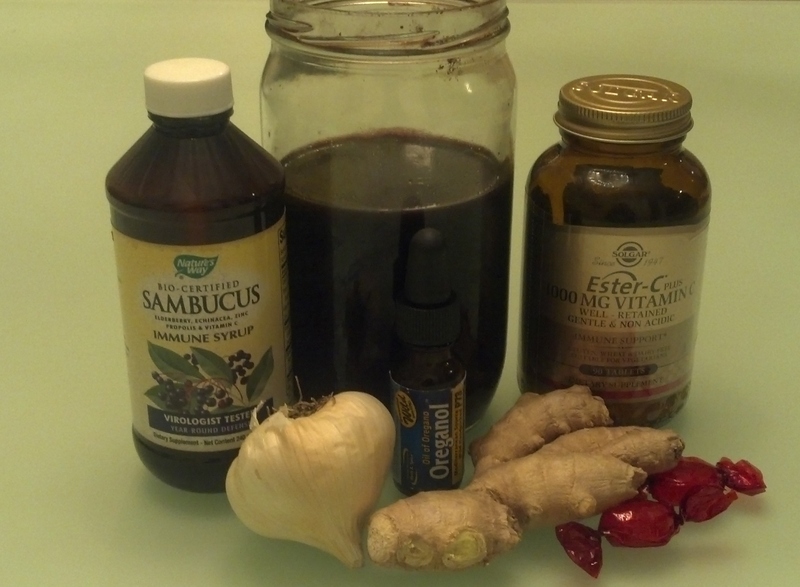 Categories: Natural Remedies | Tags: Cold, Elderberry, Flu, garlic, ginger, Natural Remedies, Sambucus | Permalink.